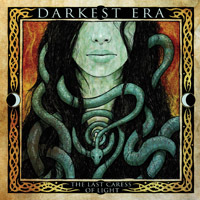 Darkest Era was recommended to me a few years back after they had put out their first demo, "The Journey Through Damnation". It was very raw, traditional metal featuring a potent dual guitar attack. There was a ton to get excited about, and I found myself frequently drifting back to their MySpace for a period to check out what they'd come up with. Fast forward a couple years, and their first full length album has come to fruition. There are four tracks from previous EPs and four new tracks. The first thing I immediately thought on hearing the first track "The Morrigan" (from the "Journey" EP) is that the vocals seem far more produced. The track lost its raw edge that really carried it on the EP. The vocals are more deliberate, which make it seem slower than before (even though the speed of the song hasn't really changed). The same can be said of "Visions of the Dawn" which was also from that EP. That's not to say the vocals aren't good; they are very good. It seems as though Krum has matured much as a singer in the three years between the Journey EP and this release. But I feel like they're the focal point here, which takes away some from the skill of the guitarists. Of the newer tracks, Heathen Burial shines the most, with an extremely catchy chorus. "The Last Caress of Light Before the Dark" and "Beneath the Frozen Sky" are okay, but lack the punch that "The Morrigan" and "Visions..." bring. "Poem to the Gael" sounds like a campfire song in the old Irish style, which I didn't really feel fit in upon initial listenings. Still, as I've listened to this album over the past week, I've stopped really thinking about it in terms of what I expected it to be, and more in terms of what it is. It's a lot slower than I was anticipating, but within this style, they still pull off some great music. It seems this disc would probably have a lot more commercial appeal compared to the rawer sound they carried before (which isn't always going to gain you cool points in the underground sector of metal elitists). It's a lot more rockish at times than anything else, but the songwriting is pretty solid and there are still some spots where the guitar work shines through. In all, it wasn't quite what I was expecting (or was hoping for), but Darkest Era has the talent to hang around in worthwhile traditional metal discussions.